Alyn & Deeside is located in the north-west of Wales. The constituency was created in 1983 and has been held by Labour ever since. The current member of parliament is Labour’s Mark Tami, who has served since 2001. I believe that personal contact is important that’s why I will be going door to door in the election speaking to and importantly listening to the views of as many constituents as possible. In my 14 years of representing Alyn & Deeside I have dealt with thousands of cases from constituents and have always maintained a fully staffed office in the constituency available to help. I get around 200 emails per day and numerous letters on a whole range of subject matters. I have held surgeries throughout the constituency and pledge to continue this level of service is re-elected. Firstly it is for the electorate to decide if I am the best candidate for the constituency. I hope people will judge me on my record, being a locally focussed MP, living in the constituency. I have gained a lot of experience over the years which has helped me tackle the ever growing case load. Some people may consider that being an MP is just about going down to Parliament. At least 50% of the work and growing is in the constituency itself. People rightfully expect that you should be available to help with their concerns. There will always be things that in hindsight you would have done differently, but I think that you have to look at the future rather than the past. My biggest regret in my 14 years in Parliament is abstaining on the amendment to reject the war in Iraq but you cannot turn the clock back. Austerity is not working. Clearly we have to make cuts but not as the coalition government chose to inflict. They claim now that the economy is growing but ignore the fact that we had four years flat lining with little or no growth at all. Families will be £1,600 worse off after the government leave office than they were when they took office. National debt has doubled under this government. Tax receipts are well down on expectations. Productivity has plummeted. Hardly a record to be proud of. They like to claim they are dealing with the so-called mess left by the previous government. What they don’t tell people is that they supported every measure to bail out the banks and maintain spending which prevented total economic collapse. Immigration is a concern for people in the UK and it would be foolish or argue otherwise. What we need is a fair system of immigration that meets this country’s needs. A lot of public concern centres on the level of wages, particularly in low skilled jobs. Labour is committed to abolishing zero hour contracts and the miss-use of agency labour, this is at the heart of the problem. The minimum wage is too low and needs to be increased. We also have to improve the skills of our own workforce, both young and old so they can meet the needs of a modern workforce. Most people are worse off than they were at the start of the coalition Government. While London may be recovering sharply other parts of the country are not and people are struggling to make ends meet. I see it every week in my surgeries. personal debt levels are at a record high. Energy costs in particular are taking up an ever increasing proportion or people’s income. This needs to be fair and we need greater control of this broken energy market. Likewise rents are rising sharply, often for substandard accommodation. We need more affordable housing both to buy but also to rent. As the economy recovers the gain should be for the many not just the few at the top. The NHS faces many challenges, growing demand and therefore the need for more investment. That should be public investment and not privatisation as some of the other parties would like to see. We need to address social care as more and more of our elderly are ending up in hospital because there is nowhere else for them to go. When we are investing in our NHS we need to make sure that the money is delivering better social care and outcomes. We need also to focus on tackling obesity and promoting healthy lifestyles to lessen the chances of us all needing the health service. Youth unemployment remains far too high in this country and there are the very young people who often become long term unemployed because they have no experience of work. A catch 22 situation. We need to intervene earlier and offer real training opportunities to our young people. An apprenticeship should be proper training leading to a proper job. Jobs growth Wales, implemented by the Welsh Labour Government has been the most successful scheme in the UK in getting off benefits and into real jobs. Parliament is still seen as a white male dominated institution, which in the main it is. Things are changing but this has been slow to say the least. I hope and believe that all MPs would represent the interests of their constituents to the best of their abilities. I believe that interests of the UK and its citizens are best served with us remaining part of the EU. 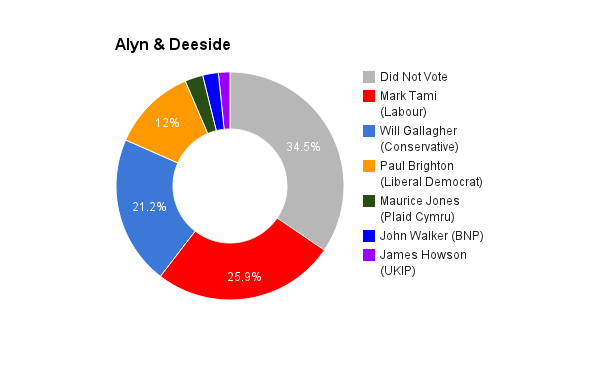 Alyn & Deeside being heavily dependent and manufacturing would have a lot to lose if we took the decision leave. Companies such as Toyota, Airbus and Tata and many others wouldn’t shut the day after but longer term we would almost certainly see investment going elsewhere, causing large scale job losses. Europe is not perfect and it needs reform but you achieve that by being at the top table and arguing your case not just moaning from the side lines.